The global hydration containers market is characterized with the presence of a highly competitive vendor landscape, says Transparency Market Research on the basis of a recently published report. The competition is expected to get tougher with several players entering the market on a regular basis. Introducing innovative products at affordable prices is a key strategy utilized by most businesses operating in the global hydration containers market to expand their consumer base. Heavy investments to bring forth technological advancements, achieving product differentiation, and attaining expansions in products portfolios, also are a few other strategies implemented by the businesses. CamelBak Products, LLC, Product Architects, Inc., SIGG Switzerland AG, Nalge Nunc International Corp., BRITA GmbH, Cascade Designs, Inc., Cool Gear International LLC., Nathan Sports, Inc., and Zejiang Haers Vacuum Containers Co., Ltd., are key players operating in the global hydration containers market. A future trend shown by these companies involves experimenting with advanced materials and processing technologies. The global hydration containers market was valued at US$8111.9 mn in 2016, which is further expected to rise up to US$12469.7 by the end of 2025. This growth is expected to occur alongside a steady CAGR of 4.9% measured during a forecast period from 2017 to 2025. With a rising intolerance towards the use of plastics all over the world, the use of eco-friendly hydration containers is a chief cause for the associated market to showcase extensive growth. Favorable regulations put forth by governments as well as other organizations encouraging the use of eco-friendly container alternatives is greatly propelling the global hydration containers market’s growth. Furthermore, extensive advancements occurring in the field of hydration container manufacturing has primarily been responsible for several varieties to get introduced in the market, thereby bringing the product prices down. 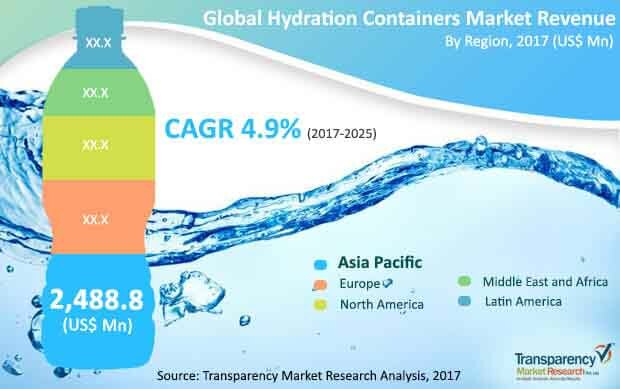 This has made it easier for even those with less disposable income to buy specific hydration container types, consequently boosting the global hydration container market’s growth. However, rampant use of hydration containers made from plastic and other synthetic containers has caused extensive pollution in many cities. Thus, the same reason that has been boosting the market’s growth could also hamper its expansion, as less usage of plastic containers could mean lesser revenue generated through these products. Less reach of eco-friendly hydration container products in remote and underdeveloped regions also has been hindering the global hydration containers market substantially. Nevertheless, many players are expected to not only regulate the sale of both plastic as well other eco-friendly products, but also to sell products that are priced cheap. This is certainly expected to reduce effects of the restraints acting on the global hydration containers market, up to a certain extent. With a rising intolerance towards the use of plastics all over the world, the use of eco-friendly hydration containers is a chief cause for the relevant market to showcase extensive growth. The completion is expected to get tougher with several players entering the market on a regular basis.